If you are feeling in the dark about your financial situation or future, who better to listen to than the third richest man in the world? 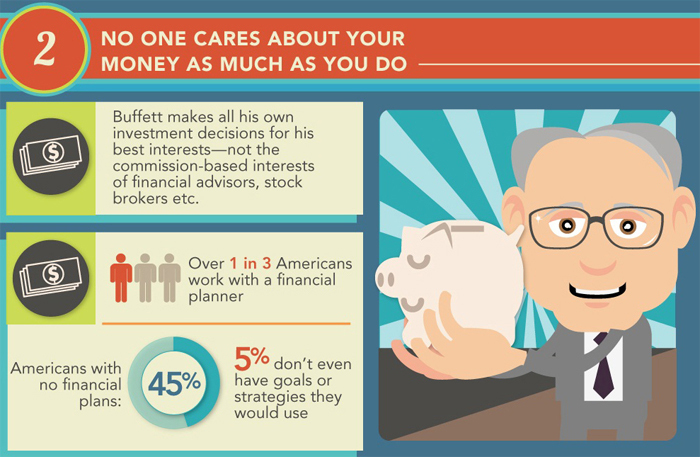 So we are here with 10 financial lessons that we can learn from Investment guru Warren Buffett. When your income is limited than your needs also becomes limited & you will defiantly think on your spending and see to it that you spend your money wisely. But when your income is unlimited than your need also becomes unlimited & you will defiantly spend your money in haphazard manner. But amazingly although Warren Buffett is richest man in world he spends money wisely as he believes in simple living high thinking. So spend money wisely and always think how you can accomplish things economically. As your earning may not be in your hand but spending money is in your hand only. Many people today relay on financial advisor or so called trading experts. As nothing is available free in this world this financial expert always see their own interest while giving you advice to you. Buffett makes all his investment decision on own for his interest & not the commission based interest of financial advisor or stock brokers. This is most important point in managing your finance. Investment without planning or understanding will always lead to disaster. Buffett spends 18 hours a day working on investment capital, saying investors should think of themselves as partial owners. Many of us hardly spend 1 hour per day on our financial matters. Fear of risk or fear of losing capital always creates negative emotion among us and we end up making wrong financial decision. One has to acquire knowledge to overcome fear of risk. 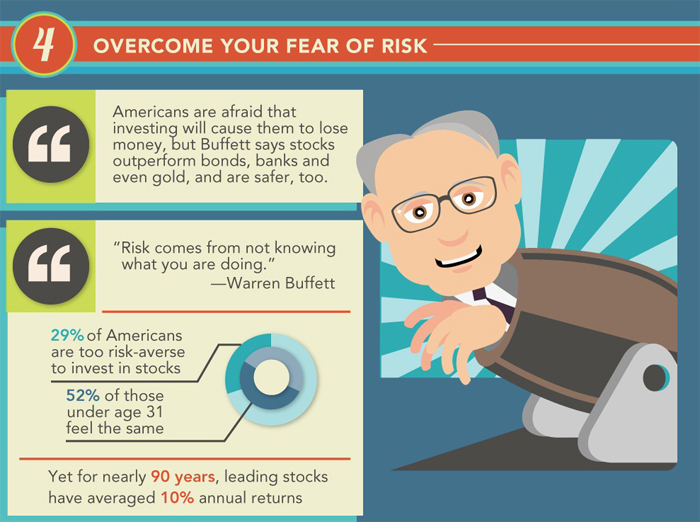 Warren Buffett says: “Risk comes from not knowing what you are doing”. So if you are not aware of what you are doing where you are investing than your investment is always at stake. Start saving/investing in early age & continuing your investment will always help in long run. 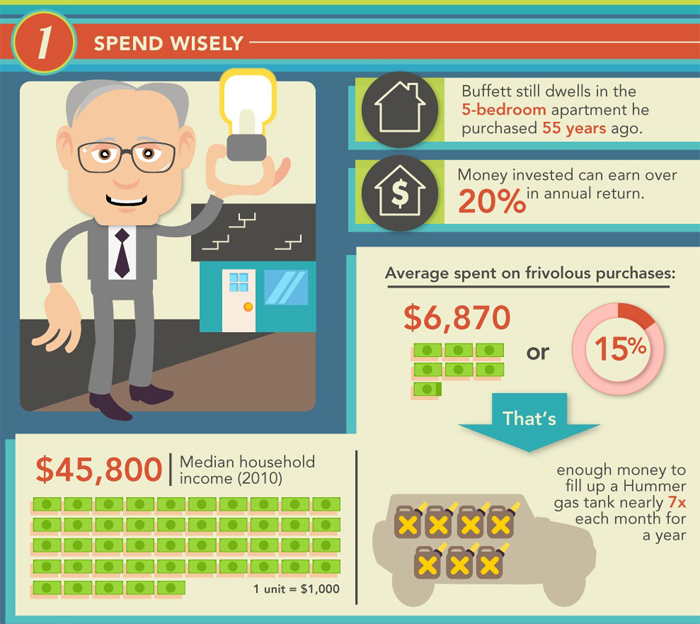 Buffett believes in same theory as putting off saving/investing means you will need to save more in less time for the same outcome. 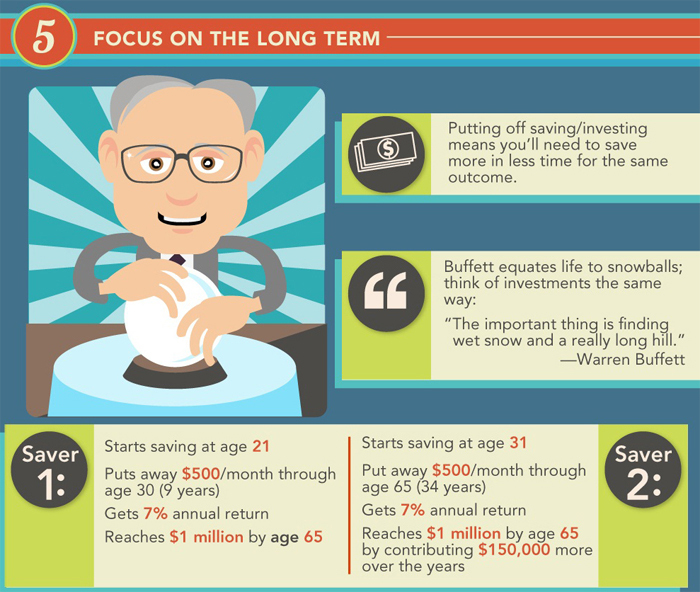 Buffett equates life to snow balls; think of investment in same way: “Important thing is finding wet snow and really long hill. 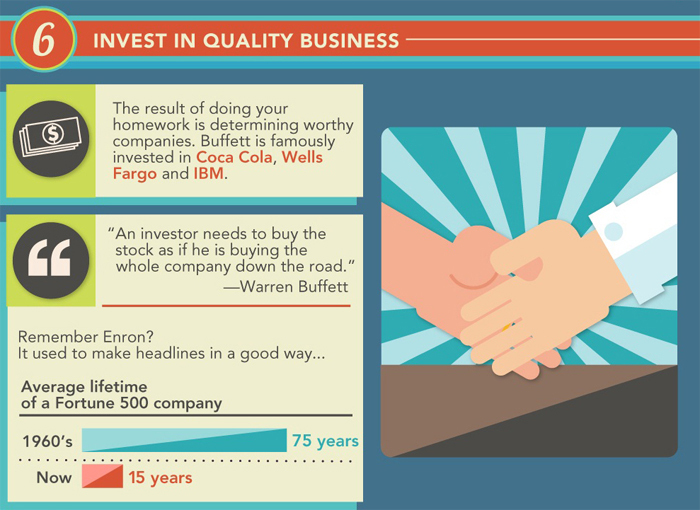 If you are purchasing stock of any company you should always go for quality business stocks. That is the reason you should do enough homework before investing in stock. 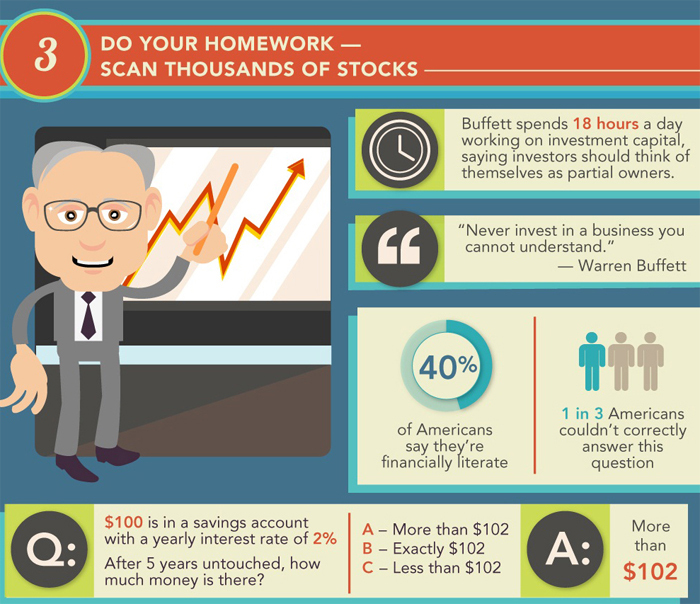 Buffett says “An investor needs to buy the stock as if he is buying the whole company down the road”. One has to hunt for solid companies in terms of fundamentals, performance, business process, assets, long terms goals and more. One should invest in these solid companies at reasonable price. 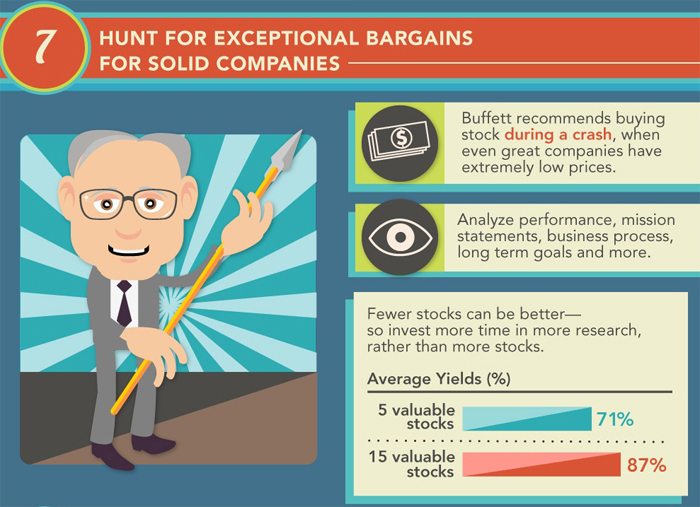 Buffett recommends purchasing stock during crash, when even great company stocks are available at low price. Investment decision of most of investor is inspired by emotion today. You should always make investment decision based on facts that how your money is actually will be used by company. Company managed by people having profitable mindset and good business insight always help. Many people become inpatient and sell stock on market crash. 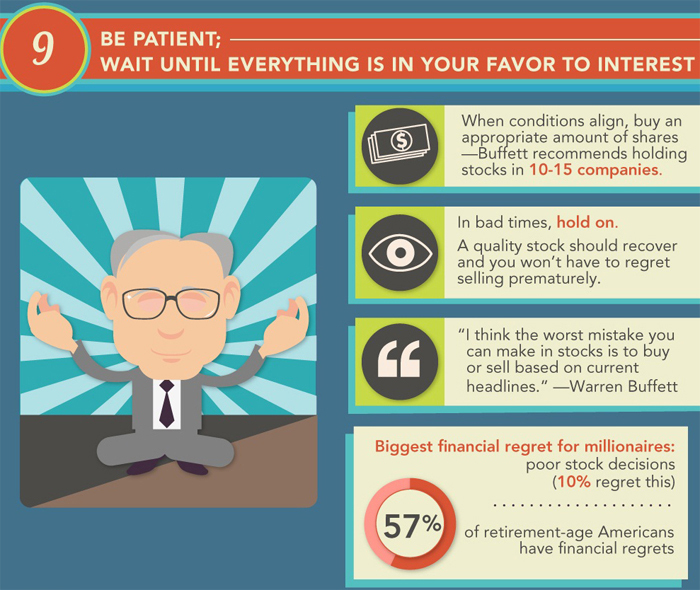 Buffett recommends to be patient & to wait until everything is in your favor. When condition like market crash arise you should opt of buy decision and not sell, in bad times hold on, quality stocks always recovers and you won’t have to regret selling prematurely. Warren Buffett says “I think worst mistake you can make in stocks is to buy or sell based on current headlines”. Buy low sell high is always expected behavior of investor. But most of investor act in reverse manner due to emotions. 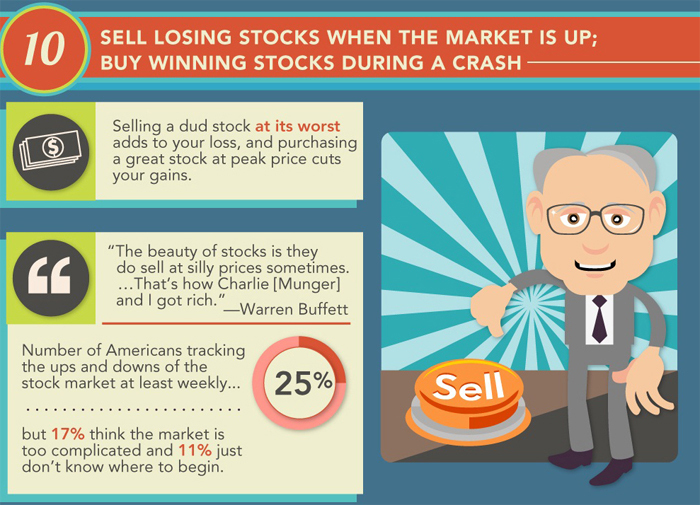 Selling flop stock at its worst always add loss to your portfolio, similarly purchasing great stock at peak price adversely impact on your profit. Warren Buffett says “The beauty of stocks is they do sell at silly prices sometimes.. That’s how Charlie (Munger) and I got rich”. 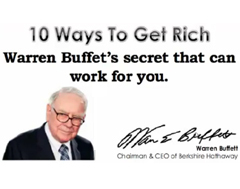 Hope these secrets of getting rich by Warren Buffett will helps you in managing your finance in better manner.